Algerians on Friday will take part in what are expected to be the biggest protests the North African country has seen in decades. 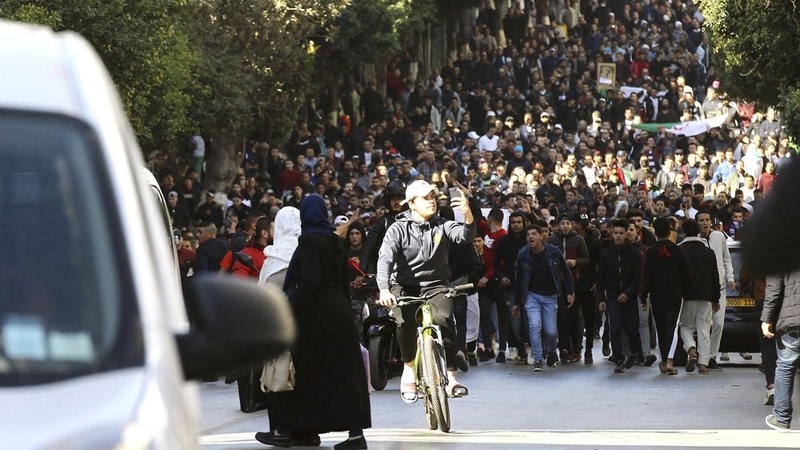 The demonstrations – dubbed the Million Man March – follow week-long protests in more than 30 cities against incumbent President Abdelaziz Bouteflika’s re-election bid for a fifth term in office. Elected president in 1999, Bouteflika’s public appearances have been few since he suffered a serious stroke in 2013. The 81-year-old’s last official trip abroad dates back to January 2012 when he travelled to neighbouring Tunisia to participate in the one-year anniversary of the Arab Spring uprisings that overthrew long-standing ruler Zine El Abidine Ben Ali among others. Authorities were taken aback by the scale of the protests that erupted on February 22 and which called on the ailing president to withdraw his candidacy. Protesters also chanted slogans against the president’s brother, Said, who opponents suspect has been running the country from behind the scenes. Hasni Abidi, a Geneva-based political analyst, said the protests marked a turning point in the history of Africa’s biggest country. “For the first time, we are witnessing protests in all of Algeria’s main cities concentrated on a single issue: the withdrawal of the president’s candidacy,” Abidi said. Mouwatana, an opposition group made of several political parties and civil society actors, also held a rally last Sunday in the capital Algiers as well as in Paris. On Wednesday, university students marched in campuses across the country, demanding the president, who is in Switzerland for medical treatment, step down, and an end to the ruling National Liberation Front (FLN) party’s hold on power. Algeria‘s political system is so opaque that analysts disagree on who wields power and calls the shots. The military, seen as one of the most powerful and well organised in Africa, has long played an important role in politics. In 1991, the People’s National Army (ALN) stepped in to deprive the Islamic Salvation Front party (FIS) of a near-certain electoral victory, resulting in a decade-long civil war. Bouteflika was brought in to head a transition period in 1999. Since assuming power, analysts say the octogenarian managed to bring the military under the presidency’s fold and restore a semblance of civilian control over the weapon bearers. This was highlighted by the controversial dismissal in 2015 of the country’s powerful intelligence chief, General Mohamed Mediene, or Toufik as he is better known, who ran the secretive DRS intelligence agency for more than 20 years. But the firing of about a dozen generals in 2018 reignited speculations of divisions in the army over whether the ailing president should remain in power, suggesting the country’s foremost institution is not entirely neutral. A leaked audio recording of a conversation between Bouteflika’s campaign manager, former Prime Minister Abdelmalek Sellal, and business tycoon Ali Haddad surfaced on Thursday, in which the two men discussed the wave of protests. Both Haddad – a Bouteflika loyalist who has seen his business empire expand dramatically under the latter’s leadership – and Sellal seemed surprised at how fast the protests escalated. Some analysts believe that the leak could’ve been made by elements within the military establishment that are against Bouteflika assuming the reins for another five years. Soufiane Djilali, president of the opposition Jil Jadid party, told Al Jazeera that businessmen like Haddad are some of the president’s fiercest supporters, because they have benefitted from preferential access to lucrative state contracts in recent years. Politicians like Djilali participated in the protests but have called for a complete overhaul of the political system to allow for free and fair elections. “If Bouteflika falls, it is his entire regime that must go with him, at which point we would have to go through a short transition period,” Djilali said. Commenting on images of protesters offering flowers to policemen, Prime Minister Ahmed Ouyahia on Thursday warned that demonstrations in Syria had started in a similar fashion. The head of government added that his intention wasn’t to “scare people”, after a number of lawmakers stormed out of the assembly, where he was giving a speech. On Monday, Ouyahia seemed to dismiss concerns over the president’s fitness for office, insisting Algerians would have the final say on who will run their country. Presidential hopefuls are in effect required to pass a medical aptitude test, the failure of which would automatically render them ineligible for the vote. Opponents fear that, like in 2014, the president will secure the medical clearance required and compete in a vote where they say the result will be settled beforehand.